At 2350 meters (7,220 ft) above the sea level, for centuries, this 5000 years old village was isolated from the rest of the world by the high mountains of Caucasus. The people here call their village Kyat, and believe that they are the direct descendants of the biblical Noah. Nowadays, they are an ethnic minority group in Azerbaijan. Due to the centuries long isolation, Khinalyg people successfully preserved their own culture, traditions and language throughout the history. The Khinalyg language is very unique and does not belong to any other known language family. The village population is about 2,100 people and divided into four main families. 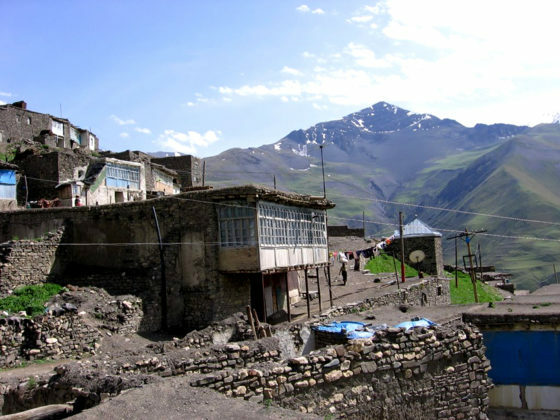 Today, the people of Khinalyg are Muslim, but in the past, they were mainly Zoroastrians. There is an Ateshgakh fire temple about 1000 meters above the village. Also, some semi-pagan traditions have survived to date tell us the religious history of the village. The first records of the Khinalyg village date back to the 1st century, in the writings of the historian Pliny and the famous Strabo’s Geography. The history of the village is also reflected in the 8 large graveyards, which have an area larger than the village itself. The graves here have 3 or sometimes, even 4 layers. On gravestones, there are various inscriptions in different alphabets indicating the rich history of the village. The houses of of Khinalug were built on the top of each other similar to a multi-story house. The unique side of this kind of construction is the roof of one house serves as a courtyard for the another one built above it. There are 350 houses in the village built in this way. The construction techniques and materials here are adapted for the harsh climate and nature of Caucasus. Most houses in Khinalyg is more than 200 years old which shows how durable and strong these houses can be. Locals cover the windows with a polyethylene film. Smoke flap placed on each house is also serving as a communication tool between the neighbours as they can talk to each other through it. Colourful and fluffy carpets usually cover the inside walls and floors to keep the house warm. Also, these carpets make the most part of interior decorations of the houses. The winters are freezing and starts earlier than the other places of Azerbaijan. During the coldest months, the temperature can be below -30°C (-22°F). Due to the location of the village, there are not enough trees around the village. Therefore, finding and burning firewood is a luxury thing here. Mainly, people burn the bricks made of straw and manure to heat during the cold weather. People make these bricks all year along and save it for winter season. They burn well and also provide sufficient heat. Around Khinalyg village, there are a lot of holy places and interesting sites, such as graves of saints (people call them “Pirs”), caves and archeological sites. Some of the graves here date back to Middle Ages. With the help of local people, visitors can find very unique places in Khinalyg. Furthermore, there is a Historical and Ethnographic Museum operating in the village. Here, visitors can learn about the history of the village and see the items used in daily life of residents. 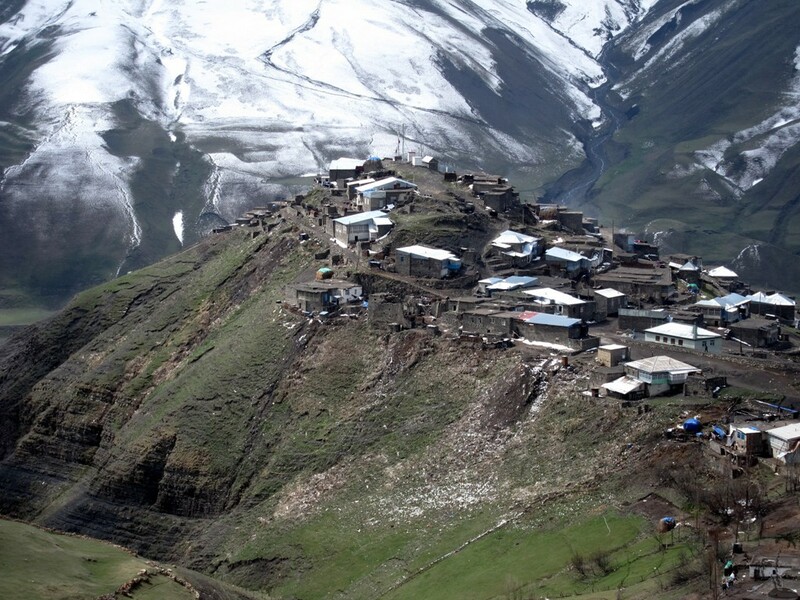 The life in Khinalyg increasingly changed after the the construction of a new road in 2006 between Quba and the village. With that, tourist flow started to the village and local people got more access to the outside world. The village became less isolated, though still it keeps its authenticity. In 2007, Khinalug became a state historical, architectural and ethnographic reserve of Azerbaijan. The entire heritage and village is now, under protection, but always open for tourists. Local people are always looking forward to welcoming the guests to show their unique village and culture, along with the traditional Azerbaijan hospitality.